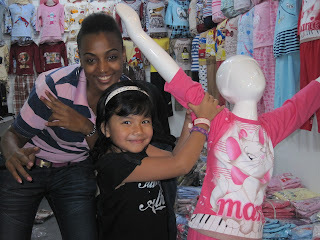 On Nov 11, after Mama finished work, we went to Dubai Global Village in Dubailand. Global Village ni ada macam2.. cultural, entertainment and shopping destination, cultures, art, theater, commerce and cuisine from around the world. Covering an area of 17,200,000 sq ft (1,600,000 m2). This place is huge. Entrance fee is DHS10 je per person (this is real value for money, tak mcm tpt2 lain @ Dubai yg cekik darah..) We went to visit India, Egypt, Africa, China, Palestine, Afghanistan, Syria, UAE, Saudi & a lot more. Cuma kita tak jumpa pulak booth Malaysia. 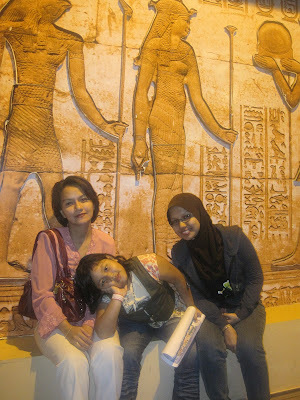 This picture was taken in front of Syria booth. Org ni jual air asam jawa sejuk dlm jug panjang yg dia carry kat belakang dia tu.. unique!. 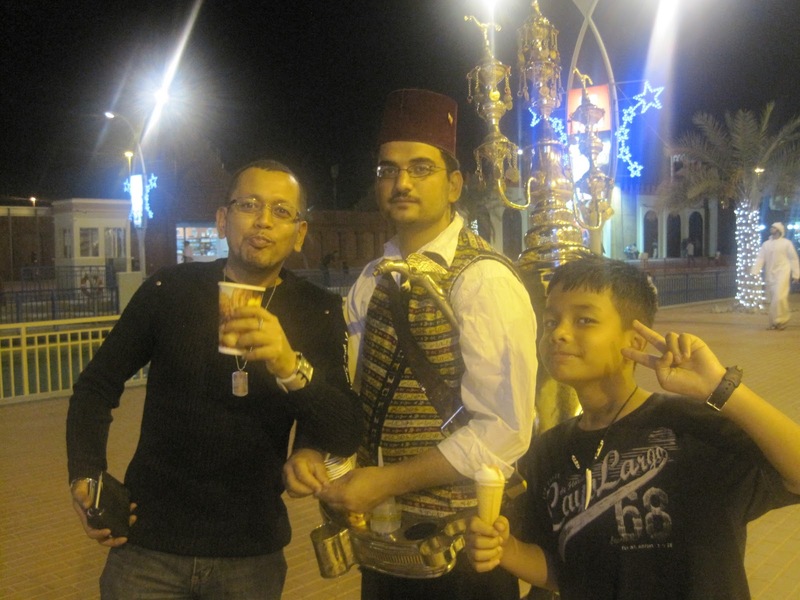 I think one cup is 15Dirham or is it 20 Dirham..
3DHS and the dancers from Africa. They were one of those countries who did a performance that nite. Yg lain from India (bollywood... Shah Rukh Khan pun ada haha..) & Japan (drum show). 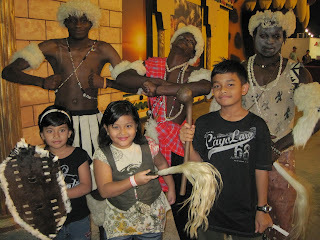 This African group buat Zulu show rasanya..